Williams, P. (2012). Deviance and diversity in dietetics. Journal of Critical Dietetics, 1 (2), 46-54. 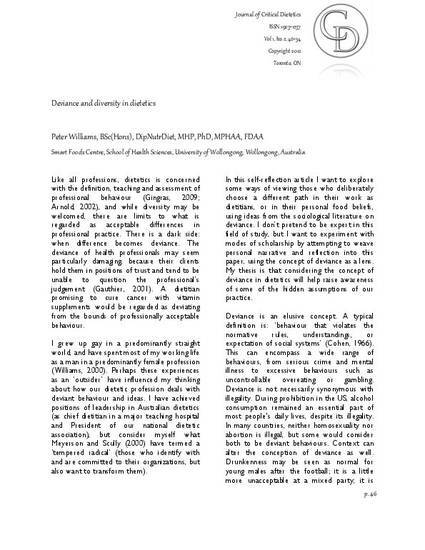 Like all professions, dietetics is concerned with the definition, teaching and assessment of professional behaviour (Gingras, 2009; Arnold, 2002), and while diversity may be welcomed, there are limits to what is regarded as acceptable differences in professional practice. There is a dark side: when difference becomes deviance. The deviance of health professionals may seem particularly damaging, because their clients hold them in positions of trust and tend to be unable to question the professional’s judgement (Gauthier, 2001). A dietitian promising to cure cancer with vitamin supplements would be regarded as deviating from the bounds of professionally acceptable behaviour.